EQ2Wire » SOE Live Registration Opens! It’s official! SOE Live 2013 Registration is now OPEN! The planned events will sound familiar to SOE Live/Fan Faire veterans, but the schedule is a bit different. The popular Player Panels are returning this year. But due to their popularity, and how crunched for time the devs have been in years past trying to squeeze everything in, you’ll notice that SOE Live activities will spill out well into Sunday afternoon this year, with Developer and Player Panels stretching until 2pm. I’m booked to fly out at 12:30pm so hopefully there aren’t any crucial panels I will miss. As it is, I’ll have to duck out of the Dev Brunch early to hail a cab. It looks like SOE listened to us about the dueling Keynotes last year which meant that we were busy with activities on Thursday, Friday AND Saturday night, so the second Keynote has been pushed to Friday morning. Friday evening we have from 5pm-8pm completely free before the Pool Party starts. Pricing is similar to past years with day and night options. 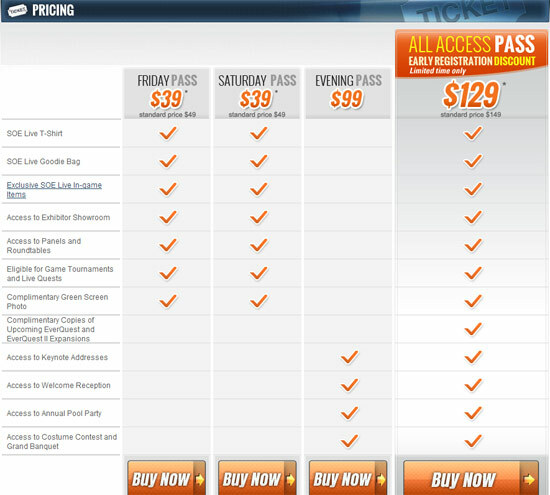 The All-Access Pass is currently $129 (it will jump to $149 on May 22nd). And the Sunday Dev Brunch from 10am-Noon has increased slightly to $59 this year. Note that hotel catering costs for medium-sized events such as a brunch can be substantial. Remember folks, the Lineup is subject to change and does not include any of the specifics about Dev and Player Panels (fitting, since Player Panel submissions aren’t even open yet!). If you don’t want to miss anything, plan to be in Vegas Thursday evening by 7PM and stick around until Sunday at least 2PM. This does not include shuttle (2+ hours), taxi (20-30 min), TSA and other delays and RL timesinks. Ill have to meet new people lol. Cant wait, ill be looking out for ya feldon! This is why I arrive Wednesday night and leave Monday morning . . . Though it’s still 3 days I have to take off work, if you have the time, might as well take it. I am going for my first time this year. Not staying at Planet Hollywood but near it at Vdada. I hope this will be fun!